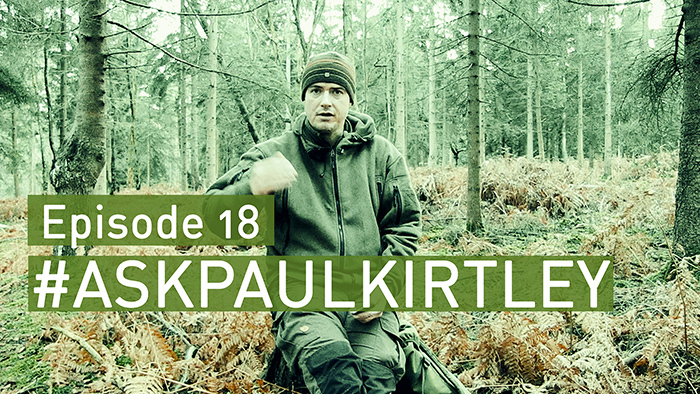 In this episode of #AskPaulKirtley I answer questions about questions about powering electronics in the wilderness, water purification in areas where there might be chemical pollutants from farming or forestry, what I have in my trouser pockets, and what you do when you get the silent treatment for booking a Frontier Bushcraft course 🙂 I also answer a question about why I left Woodlore. To answer your question to us 2016 for me will involve a few different aspects, i plan to go on a course to learnt to make a longbow and arrows from nature with basic handtools and then master the skills i learnt there enough so that i can teach others. Plenty more canoeing and kayaking skills to master as an ongoing learning adventuring experience, I am hoping to get to Norway at some point between spring and summer and I will again be in the Adirondack mountains in the US on a solo adventure later in the year but this time will be a much long and much more remote area of the mountains. For the last 5 years i have been fighting with a back injury that affects my walking and carrying ability, through constant core strength training I hope to eventually get the upper hand on this injury and reduce it’s affects on my outdoor living experiences and my life in general. What have you got planned for 2016? Do you have any adventures planned that you could be joined on by folks willing to pay their own way and carry their share of the load? Another interesting and informative video! This series is a great idea and very much appreciated! Yet another great episode Paul I really enjoyed it thank you, the items in your pocket where a great insight pretty much everything that’s in my possibles pouch. The silent treatment as well I’ve got that to come I’ll get my other half to watch this episode it might make it easier. I just really wish you had more courses up north Paul I know you have the kayaking one in the lakes and I hope to attend that in the future, keep up the great work I love to watch these episodes wishing you and all your family the best for 2016 cheers Stephen. Hi Paul, first let me wish you all the best for the coming year, lots of activities, friends and good health. As a novice in the field and to your blog, I would very much like to acquire some practical experience in bushcraft. Up to now, all my “knowledge” is pure theoretical and collected through reading and watching youtube films. Although I have all the kit that is needed (probably too much as well), I have yet to make the actual step. I think that in the coming spring or summer, I will first venture out on my own for a day or two before I will take a course. Here in Belgium, the number of bushcraft courses is very limited compared to the UK, so before I make the investment I want to be sure that it is actually my “thing”. So maybe I will turn to Wilderness Bushcraft to actually get deeper into the subject. Thanks for another informative ask Paul Kirtley. I too asked regarding outdoor power but you answered what I wanted to know in this episode so that’s great. I am booked on your wood crafter next year and having been on the beginner and intermediate courses I resolve to simply get out into the woods and put into practice all the skills learned so as to perfect them. I was out biviing up to mid December! Which is fine in the cold but I find the wet more challenging. Must get a bigger tarp to sit under! How does your rss feed get updated? Best place youtube for first release? There are three RSS feeds for this site. Then The Paul Kirtley Podcast and #AskPaulKirtley each have their own dedicated feed as both feeds contain .mp3 files for podcasts. It’s these latter feeds that feed into the respective audio podcasts on iTunes, etc. You can subscribe to each of these RSS feeds directly too of course. Oh no, so I ask too many questions now. Haven’t asked one in ages 🙂 Great episode and answers. Excellent work as always. For me, bowdrill, some nights away, knots, reading your blog and long walks identify things (trees). To answer your question, in 2016 I will practice making feathersticks and using my firesteel. I would love to do a tracking course too. I did the weekend buxhcraft course at Woodlore in 2007, but I didn’t practice what I learned. So thank you for providing the inspiration I needed to get my act together through your #AskPaulKirtley shows. Keep up the great work, it’s very much appreciated! Happy new year , about water filters with carbon in, MSR’s sweet water, miniworks has a ceramic filter with a activated charcoal core. Have used them for many year’s and they are pretty reliable. As for 2016, I’m definitely going to get outdoors more often. I also want to spend some quality time on cordage. As always plant identification is high on my list too. Maybe practice some tracking. Learn to use a Canadian canoe. Plant and tree identification and use. Learn to use and make the best of the dehydrator my wife got me for Christmas. On batteries, I have become a huge fan of the LuminAID solar lights. Thanks a lot for good inspiration, motivation and passing your skills during 2015. Resolution for 2016: Refining and mastering feather sticks with the new bush craft knife – the means to an easy fire. Camelbak sell a filter which removes the taste of chlorine from your water. They don’t give you much in the way of information, but I’d a summer (perhaps incorrectly) that this is activated carbon. It certainly looks like it, as you have to flush it through before use and the water is black. I use it in conjunction with a milbank bag and a sawyer mini. This makes for a cheap and lightweight water filtration kit for the UK. Thank you once again for putting yourself out to do the #APK series. I’m lucky in that from late May I am taking a seven month sabbatical that I’ve earned as a long service award from my employer. I am booking up lots of different trips, visits, studies, experiences etc and even if I haven’t got anything specific booked on a particular week I can still use the time to practice new stuff and brush up on the current skill set, I know I’m a hobbyist bushcrafter but practice can make the difference between an OK bushcrafter (hand flat out and tilted side to side) or an *OK* bushcrafter (thumb up). I’ll also be doing a lot of stuff on my own so whether I’m visiting a museum or in the countryside there will be no kids shouting for me to hurry up! Finally, I will also be signing up to your Tree and plant ID masterclass too. Have a happy new year and all the best for 2016. Hi Paul, loving this stuff, great info. for next year I really need to get to grips with friction firelighting. Charging gear outdoors, You can try the new fangled eco stoves with usb charger ports but you will be lucky to get one for less than £100 plus you have to pack it. I really enjoy these podcasts – many thanks. Can’t seem to download this one via Soundcloud though (it’s probably me). I have practiced bushcraft, in one form or another for several years. Recently my youngest son has taken a serious interest in it as well, so I have been teaching him the skills I know, and learning new skills along side him. This past summer my wife began showing interest as well, so next year will be spent getting the family out into the field as often as we can, and learning and practicing together. I watched on YouTube as you suggested, and replied there. However, I forgot to say how useful I found the timed topic list. It neatly overcome a problem I was having, so thanks for your suggestion to watch on You Tube instead of directly for your feed. Now I can easily go back and re-watch sections without going all through the episode. Just to say thanks another informative episode, and to wish you a happy new year for 2016. For myself next year i intend to learn more bushcraft skills and put into practise and attend one of your courses. Hi Paul! Thanks for your thoughts on powering gadgetry in the outdoors. Your comments more or less echo what I’ve already been contemplating – either use the gadgets less, or carry more kit (be that spare batteries or a charging solution). I imagine my experience in the past as a search and rescue volunteer has made me lean towards the “carry more” end of that spectrum. We all had beacon lights and head lamps on for night work so we didn’t lose each other, and the GPSs were always on so that we had a record of where we searched. Of course, a DSLR and extra memory cards, batteries, lenses, filters, sometimes a tripod, and et cetera are really heavy, so I’m trying to figure out (other than switching to my point and shoot and being limited in that way) how to lighten the load a little bit. Your comment about spending more money to invest in better gear and save some weight really echoes with me. As for my outdoors new year’s resolutions, my primary goal is to simply get out there. I have a lot of theoretical skills that I’ve practiced very little, and my goal for 2016 is simply to get out there, enjoy the outdoors more, and practice those skills. Be it a short hike near my dad’s home in the country, trips to the river valley in my city for walks, backpacking in the mountains, frontcountry or backcountry camping – my goal is just to get out there more. Thanks again for all the brilliant material you provide here – podcast, #AskPaulKirtley, the website, blog, videos, and all else! I love absorbing all the content and knowledge, and you always seem to have a solution for some outdoors question or confusion that I’ve been contemplating. Thanks again for the question. I’m glad my answer was of value to you. It’s the compact that most closely replicates a DSLR’s functionality that I’ve used. Plus it has a micro four-thirds sensor and shoots RAW. The video is very good quality too (even if it is just AVHCD). This is what I was using as the back-up camera in Episode 18 above. And it sounds like you have a great year of outdoor adventures ahead of you. Enjoy! Please do ask if you have questions along the way. Thanks Anne, you are very welcome. Let me know if you have questions along the way. Thanks for your support in 2015. Another great video, thanks yet again for your hard work in creating this series, it really is a valuable resource. – Go on a journey incorporating my bushcraft skills to not only aid me but to heighten the experiences whilst on that journey. – Get back in the Canoe. What are your goals for 2016, Paul? P.S. In regards to the “silent treatment”, why not take your other half with you? My wife has already begun her journey into bushcraft this year and has a massive fear of sleeping outside which she is boldly trying to overcome. Hi Paul . Happy new year! Keep up the good work and your definitely the one I go to for information. 1.More time in the woods. 3.Hopefully go on a bushcraft course. I have a question for you, can you recommend any bushcraft / survival course in Sweden. Yet another great episode Paul I really enjoyed it thank you. I do have pretty the same items on my person that you have. – Keep learning from you by Ask Paul Kirtley as I cannot obviously for me to attend at Frontier bushcarft course 🙂 :). Also I wish you a very happy 2016. P.S. : I sended you a question by Ask Paul kirtley some week ago but there is no trace in your lastest Ask Paul Kirtley episodes; just to be sure if you received my question or not. Just caught up with this episode. Thanks for the 2015 content and best wishes for a successful 2016 season. It nice to keep filling in gaps with knowledge snippets from your episodes. As a Scout campsite warden, I’m lucky to have access to a large are of private woodland all year round, so my new years resolution is to try and deepen my knowledge of the sites plants, trees and wildlife. This in turn enhances the enjoyment of the backpacking and cycle touring journeys I undertake each year. Thanks once again for inspiring us to keep learning. Happy New Year Paul and thanks for all the awesome podcasts and information. 1. to continue to develop identification skills for foraging. 2. Build on my natural navigation and buy the book! thanks for the nice videos and tips and comments, keep it up. well i am a self thought bushwacker and i teach or better said i work with people that are damaged by live, abuse, use of drugs or alcohol or worse, and i take them out in the forest or mountains to teach them my view of bushcraft. through that i have great results to bring them back in a state that they realize, that they can do more, they are more worth, and the can start to trust again. right now i have 96 procent succes rate and i am quiet proud of them! i don’t put myself on your level or skills, bu t i grow along the way, so my goal is to reach more people, learn more skills, and learn more about nature, special the nature here in Norway. everything i do is on volunteer base so you understand i cannot take a course by you or ray mears, that is out of my reach but i read and try out loads of new technics and if they work then i make them my own and teach them on. and i would love to be better in winter camping as you know the winter is here 7 months out of the year! my fire making skills are there, but i noticed that by temperatures of minus 35C chemical fires, or Vaseline cotton-balls dont work that well in cold, even working with kalium permagnaat and listerine worked not as normall so i switched, i have always more then 6 different ways to make fire with me, now i use in extreme cold little pieces of wood socked in alcohol, that works just fine and just gives me enough boost to start my tinders or feathersticks, bow drill or hand drill in this climate doesn’t work for me hehehehe. Working my way through all the podcasts, so this comment may be missed by many. I have some experience of the Aquapure system which has impressive test results on a wide range of contaminants including chemicals (but not arsenic – watch your ‘mates’). I fill a plastic bottlebag with macro-filtered water (Milbank or bandana style) then gravity fill my source hydration system from this using the handy but fiddley UTA (clips onto the pipe where the mouthpiece was) and the inline Aquapure. That way I don’t filter all the water I ever drink, just that which needs it; nor do I put unfiltered water into my hydration system. One does need to remember to clean the UTA however. It’s convenient never removing the hydration system from the rucksac to refill it, more of a UTA advantage than anything to do with the filter. The weakest point in the system is the bottlebag (platypus/source/etc), which gives up the ghost after a year or two of abuse. I might try a dromedary if I can find an in-the-flesh example to establish if it will seal onto the UTA OK.
Not a fast filter by any stretch. Anyway, there it is, in water bottle or in-line cartridge form – not sure if there is carbon in there, but hey, small and ‘relatively’ cheap….